Poor Farmer Brown. Life in the farming business is tough enough these days without your cows issuing demands and going on strike! How could he possibly have anticipated the mayhem that would follow his cows discovering a discarded typewriter in the barn? Click, clack, moo. Click, clack, moo. Clickety clack. Moo. 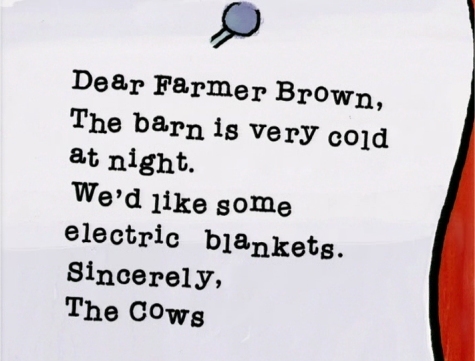 The story is very simple: Farmer Brown’s cows are cold. They type him a note and demand electric blankets. When he refuses to comply, they go on strike, and deny him their milk. The hens bustle onto the bandwagon and announce that they are cold too. The cows write a new note: “Closed: No milk, no eggs. Sincerely, the cows.” Tearing his hair out by this point Farmer Brown proposes a deal; he will exchange the electric blankets for the typewriter. Duck sets off to deliver his message. But will it end as Farmer Brown hopes? The thought that Doreen Cronin may be inspiring a generation of political activists is slightly unnerving (who dares imagine countless toddlers proposing strike action over their parents’ unreasonable demands?) but the book is great fun! There is a fantastic and genuinely funny twist at the end and the clipped little notes from the cows are hilarious. The relationship breaks down with illuminating rapidity – “Dear Cows and Hens, there will be no electric blankets. You are cows and hens. I demand milk and eggs. Sincerely, Farmer Brown” – and Betsy Lewin’s comic illustrations convey perfectly how frustrated the beleagured Farmer Brown becomes. A comic gem that adults will enjoy just as much as the children. Loved this book! Thank you for this site; I’m always on the lookout for books for my two-year-old. I especially love that you have them categorized by age.